If you're a Comcast broadband customer and you want to stream "America's Got Talent" and "Game of Thrones," Comcast has a new option for you. The company is calling it Stream, and it includes access to live broadcast channels, HBO, and a library of on-demand TV shows and movies. The service has a lot of drawbacks, and right now Comcast says it's just in beta test mode. But it's a big deal because it represents a new, easier way to sign up for TV, and because of who's offering it. Comcast is the biggest broadband provider in the United States. Stream is Comcast's latest answer to consumers' demands for smaller, simpler, web-streaming TV options. 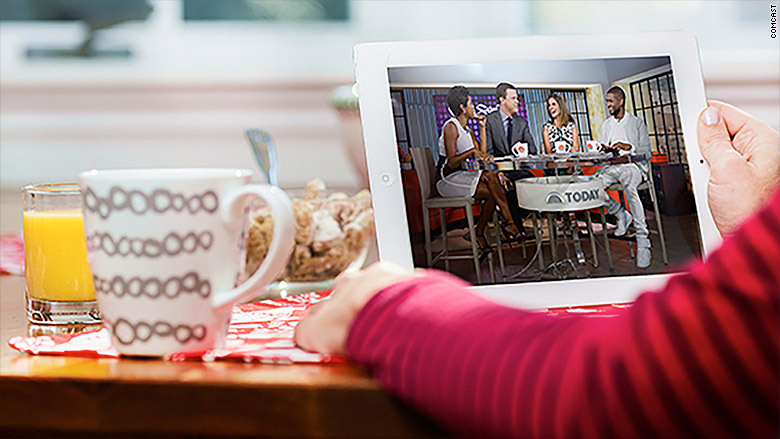 For $15 a month, Stream provides "live TV from about a dozen networks," Comcast says. Users can record TV shows and play them later. The available networks include all the broadcast networks you can watch with an antenna, like CBS and Comcast-owned NBC, and HBO. But it doesn't sound like any other big cable channels will be included, like ESPN, TNT or AMC. Comcast said it'll test the new service in Boston later this summer. Stream has most of the functionality of Aereo, the streaming TV service that big media companies like Comcast successfully sued out of business. The new offering is also a rebuttal of sorts to Sling TV, a service from Dish Network that lets people sign up for a small bundle of channels via the Internet. Sony is offering something similar. If you have a subscription to a big cable bundle, Stream is not a replacement, since it won't have many if any cable channels besides HBO. And if you like watching TV on a big-screen TV, then Stream is not for you, either. It's meant for phones, tablets and laptop screens. Nor is Stream a real rival to Netflix. While Comcast says it will include "thousands of on-demand movies and shows," that's a very small number compared to Netflix, Hulu and Amazon. So why does Stream matter? It matters because it shows how Comcast is planning and strategizing for the future. The service may be a way to hook new subscribers, particularly young people who don't want to pay big bucks for cable TV, but are willing to pay for a small selection of channels. The tests -- first in Boston, then in Seattle and Chicago, later in other cities -- will be a proof-of-concept for the company, which is mainly in the business of selling broadband Internet and expensive cable TV bundles. By launching Stream, Comcast will gain experience operating and marketing a TV service that doesn't require an annoying set-top-box or a complicated installation process. Once it's up and running, Comcast can add more channels and other features, probably at higher prices. Ultimately the company could sell a version of Stream all across the United States, not just in its own Internet markets.